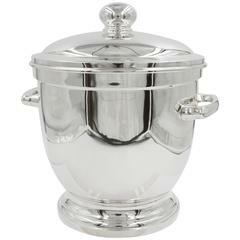 This crystal ice bucket has a sterling silver rim around the top. The crystal is cut into squares giving it an Art Deco design. It has a modern look while maintaining its original Art Deco style. 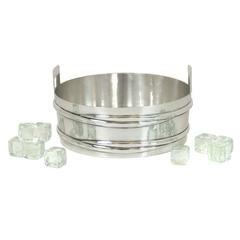 Great for a bar or dinner table, you always need ice. This Mid-Century Modern ice bucket is super sleek and quintessential of that period (Mid-Century). Great for entertaining; would look great on your bar or server. 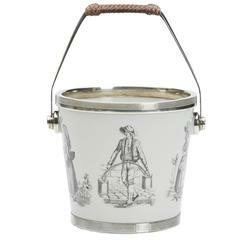 With raised grapevine decoration and mounted with handles; with vermeil liner. Underside fully marked. Interior diameter of liner is 7.5".